Most voters had never heard of Paul before he launched his quixotic bid for the Republican nomination. But the Texan has been active in politics for decades. And, long before he was the darling of antiwar activists on the left and right, Paul was in the newsletter business. In the age before blogs, newsletters occupied a prominent place in right-wing political discourse. With the pages of mainstream political magazines typically off-limits to their views (National Review editor William F. Buckley having famously denounced the John Birch Society), hardline conservatives resorted to putting out their own, less glossy publications. These were often paranoid and rambling--dominated by talk of international banking conspiracies, the Trilateral Commission’s plans for world government, and warnings about coming Armageddon--but some of them had wide and devoted audiences. And a few of the most prominent bore the name of Ron Paul. Paul’s newsletters have carried different titles over the years--Ron Paul’s Freedom Report, Ron Paul Political Report, The Ron Paul Survival Report--but they generally seem to have been published on a monthly basis since at least 1978. (Paul, an OB-GYN and former U.S. Air Force surgeon, was first elected to Congress in 1976.) During some periods, the newsletters were published by the Foundation for Rational Economics and Education, a nonprofit Paul founded in 1976; at other times, they were published by Ron Paul & Associates, a now-defunct entity in which Paul owned a minority stake, according to his campaign spokesman. The Freedom Report claimed to have over 100,000 readers in 1984. At one point, Ron Paul & Associates also put out a monthly publication called The Ron Paul Investment Letter. Finding the pre-1999 newsletters was no easy task, but I was able to track many of them down at the libraries of the University of Kansas and the Wisconsin Historical Society. Of course, with few bylines, it is difficult to know whether any particular article was written by Paul himself. Some of the earlier newsletters are signed by him, though the vast majority of the editions I saw contain no bylines at all. Complicating matters, many of the unbylined newsletters were written in the first person, implying that Paul was the author. But, whoever actually wrote them, the newsletters I saw all had one thing in common: They were published under a banner containing Paul’s name, and the articles (except for one special edition of a newsletter that contained the byline of another writer) seem designed to create the impression that they were written by him--and reflected his views. What they reveal are decades worth of obsession with conspiracies, sympathy for the right-wing militia movement, and deeply held bigotry against blacks, Jews, and gays. 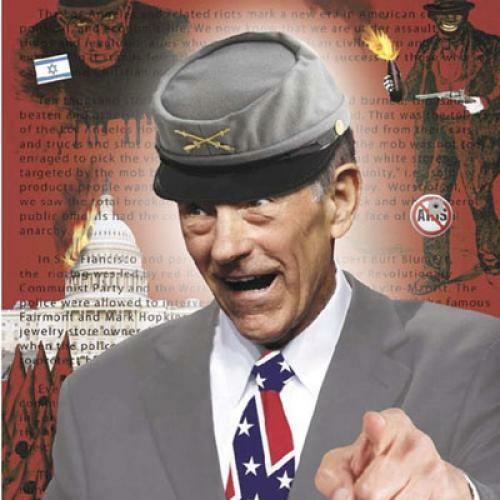 In short, they suggest that Ron Paul is not the plain-speaking antiwar activist his supporters believe they are backing--but rather a member in good standing of some of the oldest and ugliest traditions in American politics. To understand Paul’s philosophy, the best place to start is probably the Ludwig von Mises Institute, a libertarian think tank based in Auburn, Alabama. The institute is named for a libertarian Austrian economist, but it was founded by a man named Lew Rockwell, who also served as Paul’s congressional chief of staff from 1978 to 1982. Paul has had a long and prominent association with the institute, teaching at its seminars and serving as a “distinguished counselor.” The institute has also published his books. In other words, Paul’s campaign wants to depict its candidate as a naïve, absentee overseer, with minimal knowledge of what his underlings were doing on his behalf. This portrayal might be more believable if extremist views had cropped up in the newsletters only sporadically--or if the newsletters had just been published for a short time. But it is difficult to imagine how Paul could allow material consistently saturated in racism, homophobia, anti-Semitism, and conspiracy-mongering to be printed under his name for so long if he did not share these views. In that respect, whether or not Paul personally wrote the most offensive passages is almost beside the point. If he disagreed with what was being written under his name, you would think that at some point--over the course of decades--he would have done something about it. What’s more, Paul’s connections to extremism go beyond the newsletters. He has given extensive interviews to the magazine of the John Birch Society, and has frequently been a guest of Alex Jones, a radio host and perhaps the most famous conspiracy theorist in America. Jones--whose recent documentary, Endgame: Blueprint for Global Enslavement, details the plans of George Pataki, David Rockefeller, and Queen Beatrix of the Netherlands, among others, to exterminate most of humanity and develop themselves into “superhuman” computer hybrids able to “travel throughout the cosmos”--estimates that Paul has appeared on his radio program about 40 times over the past twelve years. From his newsletters, however, a different picture of Paul emerges--that of someone who is either himself deeply embittered or, for a long time, allowed others to write bitterly on his behalf. His adversaries are often described in harsh terms: Barbara Jordan is called “Barbara Morondon,” Eleanor Holmes Norton is a “black pinko,” Donna Shalala is a “short lesbian,” Ron Brown is a “racial victimologist,” and Roberta Achtenberg, the first openly gay public official confirmed by the United States Senate, is a “far-left, normal-hating lesbian activist.” Maybe such outbursts mean Ron Paul really is a straight-talker. Or maybe they just mean he is a man filled with hate. Corrections: This article originally stated that The Nation praised Ron Paul's "full-throated rejection of the imperial project in Iraq." The magazine did not praise Paul's position, but merely described it. The piece also originally misidentified ABC's Jake Tapper as Jack. In addition, Paul was a surgeon in the Air Force, not the Army, as the piece originally stated. It also stated that David Duke competed in the 1990 Louisiana Republican Senate primary. In fact, he was a Republican candidate in an open primary. The article has been corrected. James Kirchick is an assistant editor at The New Republic. This article appeared in the January 30, 2008 issue of the magazine.